Today’s unemployment news was generally good: we’re still losing jobs, but we’re not losing them as fast as we have been. For now, at least, it looks like the stimulus is having an effect and the economy might be getting ready to improve. 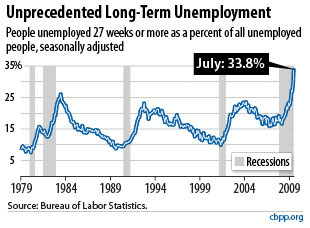 But there are still some disturbing signs, and CBPP shows one of them in the chart on the right: job losses may be slowing, but the number of long-term unemployed is at a record high, way above even the peak it hit during the 1981 recession. ….Once reserved for government jobs or payroll positions that could involve significant sums of money, credit checks are now fast, cheap and used for all manner of work. Employers, often winnowing a big pool of job applicants in days of nearly 10 percent unemployment, view the credit check as a valuable tool for assessing someone’s judgment. But job counselors worry that the practice of shunning those with poor credit may be unfair and trap the unemployed — who may be battling foreclosure, living off credit cards and confronting personal bankruptcy — in a financial death spiral: the worse their debts, the harder it is to get a job to pay them off. This is, admittedly, the equivalent of a single anecdote in the broader economic picture, but I continue to worry that a cluster of trends are converging to produce a larger class of the permanently unemployed than we’ve had in the past. It’s possible that I’m just worrying too much. But this recession has affected the poorly educated way worse than high school and college grads; it’s hit men worse than women; things like poor credit or a felony conviction seem to have become nearly permanent black marks; and unskilled jobs are continuing to dwindle despite a big drop in the illegal immigrant population. I don’t want to push this theme too far because I haven’t yet done the work to really get a reliable sense of what’s going on. But I wonder, when this recession is finally over, if we’re going to find ourselves in a European-esque mode with a large and growing population that’s almost continually unemployed or, at best, underemployed. More later.